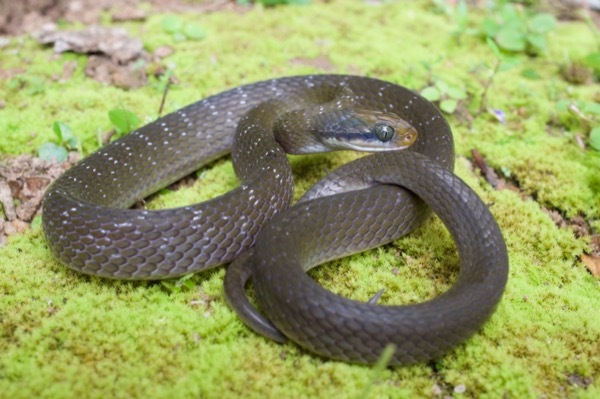 Paul found this smallish brownish snake as it gently climbed in low vegetation at the side of the trail at night. He was sure this mellow snake wasn't venomous, though wasn't sure what it was, and caught it in order to take photos the next morning. When released from its canvas bag the next morning, the formerly mellow snake had transmogrified into an apparently vicious and dangerous beast. Its head was flattened into the traditional viper shape, and it wouldn't stop coiling and striking and then trying to escape. We were no longer quite so confident that it was a harmless li'l colubrid. 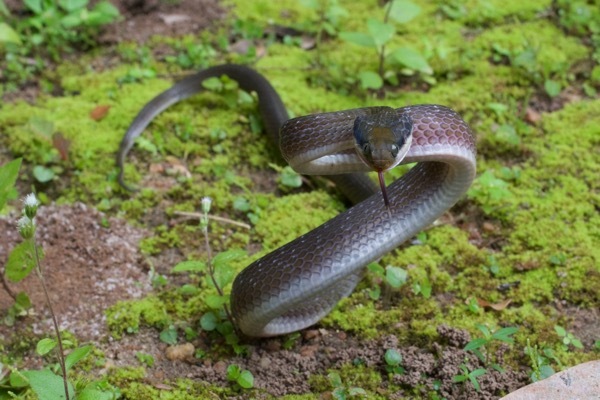 We looked through our handmade illustrated guide to snakes known from Ghana according to Wikipedia (which in turn was a slightly outdated list generated from the Reptile Database) and quickly realized that it was in fact a harmless li'l colubrid that likes to act dangerous as a defense mechanism. So everyone involved lived to tell the tale. Whew! Eventually the snake grew tired of trying to frighten us, and its head returned to its standard shape.